Featured vases, teapots, flowerpot, and tea-set at Naik Antiques and Oriental Gifts from Dec 2017 - Jan 2018. A pair of fine hand-painted falangcai vases with birds on trees. Price is available upon request. Interested parties can contact May at +6018 3867939 or email us at maynaik23@gmail.com or emperorsantique@gmail.com. A Leonardo da Vinci painting of Christ that sold in New York for a record $450 million (380 million euros) is heading to a museum in the United Arab Emirates. The newly opened Louvre Abu Dhabi made the announcement Wednesday. The 500-year-old painting is called "Salvator Mundi," Latin for "Savior of the World." It's one of fewer than 20 paintings by the Renaissance master known to exist and the only one in private hands. Christie's auction house sold it to an anonymous buyer last month. The New York Times reports according to documents it reviewed the mystery buyer was a little-known Saudi prince. Christie's says it doesn't comment on the identities of buyers or sellers without their permission. The highest known sale price for any artwork had been $300 million (253 million euros), for Willem de Kooning's painting "Interchange." 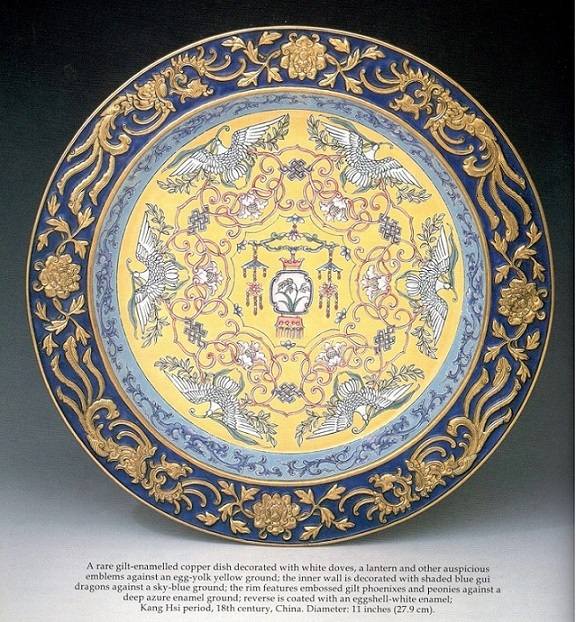 It talks about ceramics from the Neolithic period - Qing dynasty.. It covers various museums throughout China. The 'tour guide' is a curator from the Shanghai museum. And that was before the painting obliterated every previous auction record, selling, with premium, for $450 million. Had the buyer of the most expensive painting in the world just purchased a piece of junk? After speaking to multiple prominent old masters dealers— a group not exactly known for holding its tongue— the real issue regarding the Leonardo’s validity seems to be a question of education: “All old masters have had work done to them,” says the dealer Rafael Valls, whose London gallery is directly across from Christie’s. Those in the art world who dismiss its authenticity, dealers say, are simply transferring criteria used to judge contemporary art onto old masters—the equivalent of comparing the specs of a new Honda against a Ferrari from 1965. They’re both cars, but that’s where the similarities end. A 1,000-year-old bowl from China's Song Dynasty sold at auction for $37.7 million on Tuesday, breaking the record for Chinese porcelain, auction house Sotheby´s said. The small piece -- which dates from 960-1127 -- broke the previous record of $36.05 million set in 2014 for a Ming Dynasty wine cup which was sold to a Shanghai tycoon. Bidding started at around $10.2 million and the auction lasted for 20 minutes before the winning offer came from a phone bidder. The bowl -- originally designed to wash brushes -- is an example of extremely rare Chinese porcelain from the imperial court of the Northern Song Dynasty and one of only four pieces in private hands, according to Sotheby's. The sale broke the "world auction record for any Chinese ceramics", the auction house announced after the bidding. It exceeded an earlier record made by a tiny white porcelain cup, decorated with a colour painting of a rooster and a hen tending to their chicks, created during the reign of the Chenghua Emperor between 1465 and 1487. The cup sold in 2014 to taxi-driver-turned-financier Liu Yiqian, one of China's wealthiest people and among a new class of Chinese super-rich scouring the globe for artwork. Add: 111M, Jln SS 21/37, Damansara Utama (Same row as HSBC), 47400 PJ, Selangor. For further inquiries, please do not hesitate to contact May at 018 3867939. “Chinese vase sells for record price. ” Heard it before? Well, here we go again. Last Saturday, a bidding war lasting seven minutes unexpectedly erupted during Sheppard’s auction of Chinese Ceramics, in Durrow, Co Laois. Lot 86, an antique blue-and-white “Qing Period” vase measuring just 23cm sold for €740,000 – 740 times its median pre-sale estimate (€800-€1,200) – and a record price for a piece of decorative art at auction in Ireland. Why was it so valuable? The vase was catalogued as “Qing Period” – a reference to the imperial Qing dynasty that ruled China from 1636 until 1912. But the bidders believed that the vase had a personal connection to the 18th-century Emperor Qianlong who reigned from 1735-1796 and was a major patron of the arts and a collector of carved jade, bronzes and ceramics. The vase was likely to have been either part of his personal collection or to have been given by him as a gift to, perhaps, a visiting dignitary. The price beat the previous record – also achieved by Sheppard’s in 2012 when a matchbox-sized, carved Chinese jade seal sold for €630,00. The estimate for the seal had been €4,000-€6,000. Both are classic examples of auction “sleepers” – the term used to describe items which have been massively, and unintentionally, undervalued but are spotted by at least two bidders who believe the true value to be far, far higher. Chinese “sleepers” have emerged at Sheppard’s and other Irish and international auction houses during the past decade – and achieved jaw-dropping prices – as a generation of newly-rich Chinese collectors roam the world seeking to buy back items associated with the country’s imperial past. But a bemused public may wonder why does this keep happening? Auctioneers say that Chinese ceramics can be very difficult to value with absolute precision even by the most eminent experts. Items continue to slip through the net – to the delight of vendors and, of course, the auctioneers who earn whopping commission on such sales. Of course, it’s not just Chinese antiques that can cause a surprise. For example, at Adam’s auctioneers in Dublin in April this year, a painting of Christ with a top estimate of €800 sold for €120,000. But, in recent years, it is Chinese “sleepers” that have attracted most attention. The first major such sale in Ireland took place also at Sheppard’s in 2010 when another blue-and-white Chinese vase valued at around € 100, and consigned by a Carlow family who thought it was only of ornamental value, was bought by a London dealer for € 110,000. Since then, there have been quite a few spectacular prices achieved at Sheppard’s and other auction houses both here and overseas. Spotting the imperial pieces among the sea of blue-and-white antique Chinese porcelain has become the stuff of legend in auction rooms worldwide. The market for antique Chinese porcelain is also reputedly full of counterfeits and so buyers and collectors need to exercise extreme caution. If you own a piece of Chinese porcelain and have never had it valued – now might be a good time to visit an auctioneer for a free valuation. Sotheby’s plunged the most in nine months after second-quarter earnings missed estimates due to higher expenses. The New York-based auction house of fine art and collectibles reported a 14 percent decline in profit for the period ended June 30, according to a statement Thursday. Net income slid to $76.9 million from a year earlier even as the company sold the most expensive artwork of 2017 in May -- a Jean-Michel Basquiat painting for $110.5 million. Chief Executive Officer Tad Smith said on a conference call that the art market “is healthy and efficient but neither frothy nor depressed.” Masterpieces that are fresh to the market result in “eye-popping" prices while lesser works need “realistic” prices to sell. Like rival Christie’s, Sotheby’s saw an increase in high-priced lots. The number of works priced at more than $1 million rose 5 percent during the first half of the year. The number of buyers and sellers in that price range increased by 10 percent and 13 percent, respectively, he said. Private sales for the first half rose 34 percent to $333.8 million. Sotheby’s reported adjusted earnings of $1.44 a share, compared to the $1.51 average estimate of five analysts in a Bloomberg survey. Revenue of $314.9 million slightly missed the estimate even as it increased 5 percent. Expenses rose almost 20 percent. The company attributed this to the projected payment of target bonuses for employees and investment in areas such as technology, digital marketing and specialist expertise. Also with more higher-priced works in the mix, Sotheby’s auction commission margin was largely flat for the quarter at 16.3 percent. The shares slid 8.3 percent to $51.15 at 4 p.m. in New York, the biggest decline since November 2016. On July 25, Sotheby’s closed at a record $57.70. “It is a sacred mountain,” acknowledged Dr Sodnom Tsolmon, professor of history at Ulaanbaatar State University with an expertise in 13th-Century Mongolian history. “It doesn’t mean he’s buried there.”Scholars use historical accounts to puzzle out the location of Genghis Khan’s tomb. Yet the pictures they create are often contradictory. The 1,000 running horses indicate a valley or plain, as at the Xiongnu graveyard. Yet his pledge pins it to a mountain. To complicate matters further, Mongolian ethnologist S Badamkhatan identified five mountains historically called Burkhan Khaldun (though he concluded that the modern Burkhan Khaldun is probably correct). China has banned the auction of antiques looted from the country throughout history in its latest regulation on cultural relic auctions. The document, issued by the State Administration on Cultural Heritage on October 20 and released on its website on Monday, stated that all cultural relics that were stolen, illegally unearthed, smuggled or looted from China would be banned from being auctioned in the country. It also said the Chinese government had priority in buying precious antiques. According to the regulation, the administration can appoint state-owned relic collection agencies to procure such pieces from their consignors at an agreed price. Those artefacts would no longer be accepted for auction. The new regulation replaces a temporary rule on the auction of cultural relics that the administration issued in 2003, which banned the auction of antiques “with disputes regarding their right of disposition”. The new version replaced that clause with much stronger wording that explicitly bans the auction of “historically looted Chinese relics”. Internet commenters were quick to point out that the regulation applies only to auction houses on mainland China, while most valuable Chinese antiques are sold in overseas markets, such London, Paris, New York and Hong Kong. According to the United Nations Educational, Scientific, and Cultural Organisation, about 1.67 million Chinese relics are housed in more than 200 museums across 47 countries. The Chinese Cultural Relics Society said China had lost more than 10 million antiques since 1840 due to wartime looting and illegal excavations. China has in the past resorted to bidding in overseas markets to recover its lost national treasures. In 2000, the Poly Art Museum, owned by the state-owned Poly Group, won the bidding at Christie’s and Sotheby’s auctions in Hong Kong for three bronze heads looted from the old Summer Palace in Beijing by British and French troops in 1960.